It's still a little on the early side for spring to officially start (especially when parts of the country are still covered in snow!) but sunny days make me crave lighter dishes and fresh vegetables from the farmer's market. We are seeing warm sunshine here in Northern California for the first time in what has seemed like a long, long time. It's still a little on the early side for spring to officially start (especially when parts of the country are still covered in snow!) but sunny days make me crave lighter dishes and fresh vegetables from the farmers' market. Most of the recipes below will work with whatever veggies are in season in your area, so feel free to substitute for your favorites! Explore the offerings at a local farmers' market—you'll get a good price on your produce, and everything there is at the peak of freshness. Good for you, and good for your local farmers too! My mom used to make this recipe when I was growing up. I adore Brie cheese and love the melt-y bits of it with tomato and just a touch of spice. You could also toss in cooked broccoli or asparagus spears after the cheese melts for some extra nutrients and bulk. 1. Cook the linguine in boiling salted water. Drain and set aside. 2. Sauté the shallots and garlic in the olive oil over medium heat. Add the tomatoes and red pepper flakes and simmer everything together for 5 minutes. 3. Add the hot, cooked pasta and the cubed Brie cheese to the mixture and toss together until the cheese melts. Sprinkle with freshly ground black pepper and serve with a green salad on the side. Salmon is my favorite fish to grill! Serve this recipe with a side of Israeli couscous and roasted Brussels sprouts. 2. Combine first four ingredients in a small bowl. Working one salmon fillet at a time, rub with a little sea salt followed by the paprika spice mixture. 3. Grill fish for about 6 minutes before drizzling with agave nectar. Grill for an additional 2 minutes or until grilled to preferable doneness (I like my salmon on the rare side). 4. This recipe also works well under a broiler in the oven if you prefer, or if you do not have a grill. I recently became absolutely addicted to beet salad, and this is the closet replica I could make of my very favorite one at a local pizzeria in Sonoma. 1. Preheat the oven to 400°. Spread out chopped beets, parsnips, and sweet potato on a greased cookie sheet, and roast for about 30 minutes, or until the veggies are tender, stirring periodically. 2. While the veggies are roasting, toast the hazelnuts in a dry skillet over medium high heat, tossing continuously until the nuts start to give off a roasted aroma. Be careful not to burn—this should only take about 5 minutes! 3. Arrange the salads. 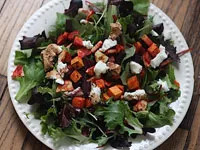 Divide the lettuce onto 4 plates and top with the roasted vegetables, about 2 tablespoons of goat cheese and a small handful of nuts. Drizzle balsamic vinegar on each salad and serve. A great example of an "everything goes" one-pot meal! The best time to make this is right after a trip to the farmers' market; the veggies I use here are easily substituted for whatever you can find that looks the best. Asparagus spears are wonderful in this as well! 1. In a large saucepan, combine everything except for the walnuts and seasonings. Bring to a boil then reduce heat to a simmer and let cook until the rice has absorbed the water (stir a few times). This will take about 30 minutes. Add the walnuts and season to taste with salt and pepper. People say you have to constantly stir risotto but I never do—it takes too long! I just let it be and it always turns out perfectly.